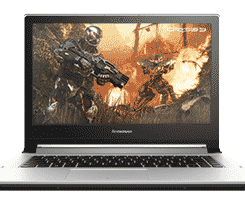 Lenovo Y50-70 15.6" 4K Gaming Laptop Core i7-4710HQ 16GB RAM 1TB HDD + 8GB SSD. 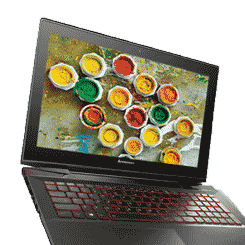 Give a boost to your gaming by Lenovo Y50 Gaming Laptop. It features Ultra-HD (3840x2160) resolution display combined with premium audio. Packed with powerful Intel Core i7 processor and latest graphic technology, this device takes your gaming to the next level. Its AccuType keyboard has keys with finger friendly curves and ergonomic space bar which increases your typing speed and also reduces fatigue, letting you type comfortably for long periods of time. It also gives you more accuracy and minimizes your typing errors. This backlit keyboard has red light which adds in its style. Lenovo Y50 is extremely portable as it weighs only 2.4kgs and is only 23.9mm thick. This slim and light laptop packs powerful Intel Core i7-4710HQ processor for high performance and more responsiveness. Preloaded with Windows 8.1 this laptop gives you more productivity. You cannot have maximum advantage of your laptop until you have storage space large enough to store your important files and data. For this purpose it comes with 12 GB of fast DDR3L memory, up to 1 TB of HDD, or up to 8 GB of Solid State Drive (SSD). SSDs increase your performing speed as it gives you faster access of files and applications and also reduces the startup and shutdown time. You cannot enjoy your games until you have outstanding audio quality. Lenovo Y50 features JBL Speakers and Dolby Advanced Audio which enables you to hear sound with more definition and less distortion. You can listen to this high quality audio through headphones as well. Dolby Advanced Audio delivers you cinematic surround sound allowing you to have more enjoyment while watching your favourite movies. JBL Stereo speakers and subwoofer you can experience amazing sound while playing games or playing songs or movies. Its HD webcam enables you to enjoy your video chats in good quality. With the built in 720p resolution you can take pictures which will look good even on HDTV. It features enhanced low light capabilities through which you can take bright pictures whatever the lighting conditions are. Lenovo G505 lets you watch your media on big screen by connecting your laptop to multiple AV devices via HDMI port. It streams data through one cable minimizing the need of multiple cables. With multiple connectivity options offered by Lenovo G505, data transferring has become less time consuming. Enjoy internet in public by its built-in 802.11 a/b/g/n or 802.11 a/c Wi-Fi adapter or use bluetooth4.0 to share your files with other mobile devices. It also allows you to connect USB 3.0 which transfers data with ten times faster rate than USB 2.0. A four in one card reader is also added to make your data transfer further easier. VeriFace Pro technology is a new secure way to log in to your computer. It checks head movement to verify if the real person is trying to log in. It supports multiple user. This technology also helps you to encrypt and decrypt your sensitive data and also alerts you on unauthorized use. Lenovo G505 is equipped with an extra-long battery in order to give you complete entertainment without any break. This high capacity battery gives you up to five hours of productivity before it needs to be recharged. So get most out of your laptop PC with its long battery life.